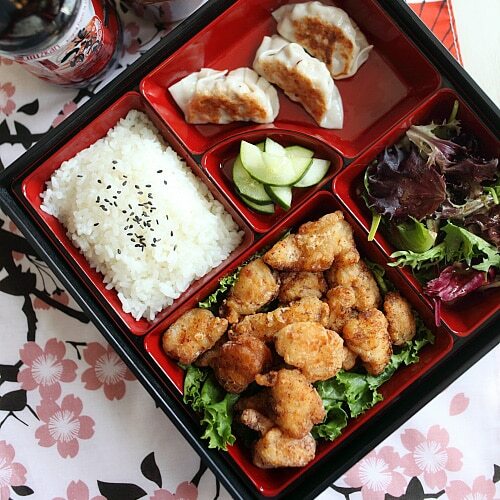 Japanese Fried Chicken Bento with steamed rice and sesame seeds, pickled cucumbers, salad and Gyoza. One of my favorite bento is chicken karaage, or Japanese fried chicken bento. In the United States, chicken kaarage is also referred to as sesame fried chicken in many Japanese restaurants. Other than chicken teriyaki, chicken karaage is probably one of the most popular combinations when it comes to Japanese bento. If you have had Japanese food or lunch box, I am sure you have tried the crispy and flavorful Japanese fried chicken. I simply can’t resist the good taste. Making restaurant-style bento is actually easier than you think, and the whole process of assembling the different dishes into the bento box is actually quite fun. When I started making bento at home, I got myself a 5-compartment bento box, which is widely used in many Japanese restaurants. Please take note that there are a wide variety of bento boxes available: plastic, wood, lacquer ware, 2-tier, single compartment, 2 compartments, up to 7 or 8 compartments, and the list goes on. When it comes to choosing the size and type of bento box, it’s really a personal preference and what works best for you and your needs. If you are a working professional, you should probably start with a simple 2 to 3-compartment bento box. Use short-grain rice for the steamed rice and always cook the rice ahead of time to allow for cooling before assembling. Sprinkle some black sesame seeds on top of the steamed rice to enhance the presentation. You can also add some green peas to the rice. The key to a great bento is to make plain looking food looks interesting and hence pleasing to both the eyes and taste buds. Sauces such as dipping sauce and salad dressing should be packed in separate sauce containers to avoid spillover and ensure freshness, especially if the bento is meant to be taken out or consumed later. Avoid raw fish or sashimi (especially in warmer weather) unless the bento is served immediately. Avoid soupy or watery dishes as they don’t pack well in a bento box. Traditionally (regardless of the size or type of the bento box), the perfect ratio of a healthy bento is 3 parts carb (rice, noodles), 1 part protein (meat or fish), 2 parts vegetables/fruits. However, this is a guideline and not rules. If you are a vegetarian or vegan, you can still pack a bento! This is my Japanese fried chicken bento. Other than the main dish of chicken karaage, there are steamed rice, gyoza, pickled cucumber and mixed green salad. Here is my empty bento box with the different compartments and how I pack my bento. A typical restaurant-style bento usually consists of steamed rice, main entree, side dish, tsukemono (Japanese pickle), and salad. For the Japanese fried chicken, I marinated the chicken meat with Mizkan (Bonito Flavored) Soup Base, consists mostly of soy sauce and dashi. I also added some Mizkan HONTERI® Mirin for a tint of sweetness. For the tsukemono, Mizkan rice vinegar comes in handy as a little dash goes a long way in the simple cucumber pickle. To balance off the taste of the bento, I chose Mizkan Sesame Dressing for my salad. The end result was a beautiful bento packed with all my favorite Japanese dishes that I just couldn’t stop eating! Cut the chicken into bite-sized pieces/cubes. Use paper towels to pat dry the chicken and transfer to a bowl. Grate the ginger and extract the juice by squeezing with your hand, you should get about 1 tablespoon ginger juice. Add the Mizkan (Bonito Flavored) Soup Base, Mizkan HONTERI® Mirin, and ginger juice to the chicken and marinate for 30 minutes. 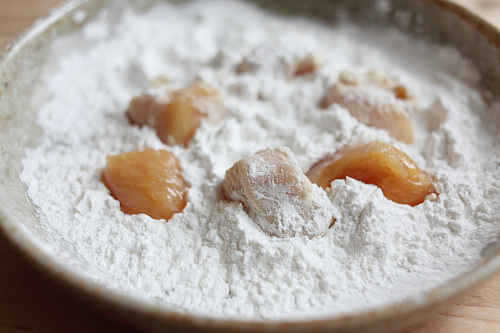 Transfer the chicken out of the marinade and coat them evenly with the corn starch or potato starch. Shake off the excess. Heat 2 to 3 inches of oil in a pan or small stockpot to 350 degree F for deep-frying. Gently drop the chicken pieces into the oil and deep-fry until golden brown. Dish out with a strainer or slotted spoon, draining the excess oil by laying the chicken on a dish lined with paper towels. Cut the cucumber lengthwise and then slice into small pieces. Transfer the cucumber to a small bowl and add the salt, sugar, Mizkan Rice Vinegar and mix well. Chill in the refrigerator for 30 minutes. Arrange the salad in the salad compartment of the bento box. Drizzle some Mizkan Sesame Dressing on top of the salad. Lay a piece of lettuce leaf on the main dish compartment. Arrange the fried chicken on top of it. Add a bowl of steamed rice in the rice compartment and top with some black sesame seeds. Add 3-4 gyoza in the side dish compartment. Add the chilled cucumber pickle in the tsukemono compartment. The bento is now done and ready to be served. For the gyoza recipe, please click here. For other Japanese bento recipes such as salmon teriyaki, please click here. Wow, your bento is gorgeous and I’m sure it’s delicious. I’m Japanese so I grew up with bento…happy and proud that bento is catching on here. I always order teriyaki bento with beef, chicken or salmon. I’ve seen the karaage on menu and I’ll have to try this fried chicken next time. As always, great pictures and easy ways to make at home! Look yummy! Fried chicken bento is always my favorite. Hi! Your bento looks super yummy! I saw you in a recent episode of House Hunters International…I was thinking she looks familiar, and then they mentioned your blog :) Keep up the good work here and all the best with your new home! New subscriber here, love Japanese bento. Can you share teriyaki chicken recipe? Oh I just love fried chicken! And in a bento, it is even more adorable!Thanks for sharing this delightful recipe idea! Hi, where can I get Mizkan products online? This karaage fried chicken looks simple enough to make but I want to get the same ingredients you have here. Oh your bento look and sound perfect! Love the combination with fried chicken, dumplings, rice, salad..tasty for sure! Thank you for sharing! Hi, where did you get your bento box from?Thanks. I got it from Marukai. You can check out the online store at Marukai. OH, this makes me miss the days we used to live in Japan. I worked in a school with my children and every day I couldn’t wait for lunch to see what goodies would be delivered in our obento boxes. Sarah – tell me about it. I miss those days when I traveled there for business. I was always so looking forward to the lunch bento with so many delicious dishes in one box. So yummy! Another winner! Love seeing you make Japanese recipes so accessible to people living in other countries! Thanks Rachael. I love making bentos. I was wondering if I would be able to use one of the images of bento boxes for a one time only publication on this topic? Please send me an email if that would be OK.
Hi, this looks AMAZING! I was just wondering if this would be okay to eat cooled/at room temp? I would love to make it for work, but I usually wont get a break until 3hrs in. I could put it in the fridge till then, but thought I would ask first. Thank you! Yeah you can but it will not be as tasty.